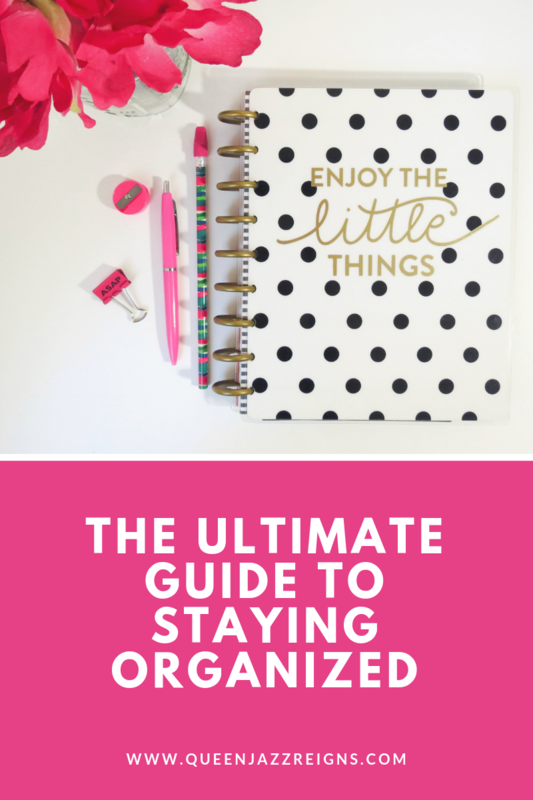 Do you have intentions on being organized but you don’t know where to start? Well, hopefully you can follow the tips listed and become a more organized individual. You can begin by asking yourself one question. Are you the type that likes to write things down on paper or do you prefer to use electronics to do the work for you? Either way, the tips below can apply, you just have to go about them differently. Let’s jump right into the first tip. You need to use a planner. Period. Whether you like to keep track of items in your phone or in a physical planner, it’s best to use one. I prefer to use physical planners. I really like that I can keep track of other items within the planner (i.g. debt tracker, daily tasks). Having a tangible planner also makes me feel a bit more professional to be honest. I can easily pull it out and see what I need to accomplish that day and that week. There are so many different planners to choose from and I am very particular about the ones that I use. The one planner that fits all my needs is the Erin Condren Life Planner. Their features have been continuously improving over the years, making it an awesome way to stay organized. You can customize and personalize your covers, and even switch them out if you find another one or five that you like! I was introduced to this planner in 2013 and even though I’ve tried other planners, I’ve always ended up repurchasing the Life Planner by Erin Condren. You can purchase your own Erin Condren Life Planner here. Monthly view of January 2019 ready to be filled in. I found that if I use my favorite pens and stickers to decorate my pages that I am more likely to use my planner and stay on track (review coming soon). I love to write things down. It can be anything honestly! Since I like to write things down, I’m obsessed with pens, post-it notes, and planners. Yep, I have a problem. I don’t like to rely on my memory. What if one (or all!) of the details you remember is wrong? That is why I prefer to write notes down either in my planner or in my Notes app on my phone. Since I don’t use my phone for planning I can use Notes and then transfer the notes to my planner later. There are may apps like Evernote that can be of use if Notes doesn’t meet your needs. Blocking time off on your schedule can be very helpful for time management. If you block off time on your schedule then you can focus on a specific task at a specific time. For example, in your planner you would block off 15 minutes from 9 – 9:15 am daily to check emails and that would be your main focus at that time. You would set it up as an appointment and you would be considered busy at that time. In this day and age, everyone is on their phone! It drives me crazy sometimes. Being on social media at random times throughout the day can really throw off your productivity. It’s also very easy to lose track of time when you are scrolling through Instagram or Facebook. It may be hard to set times to be on social media but you can start by not jumping on it when you first wake up. You can also utilize the applications that block your access to certain social media apps and websites for certain periods of times. There are various apps for iOS, Mac, android and PC users. For some people, like me, checklists can boost your productivity. If you have a list of tasks that need to be completed, checking them off one by one can help you feel a sense of accomplishment. As you complete your tasks you have a great indication of what you will need to carry over to the next day and then you can continue the process. Life can be hard, so don’t beat yourself up if you find that you don’t become organized overnight. It takes time. But, once you are organized you will feel so much better! 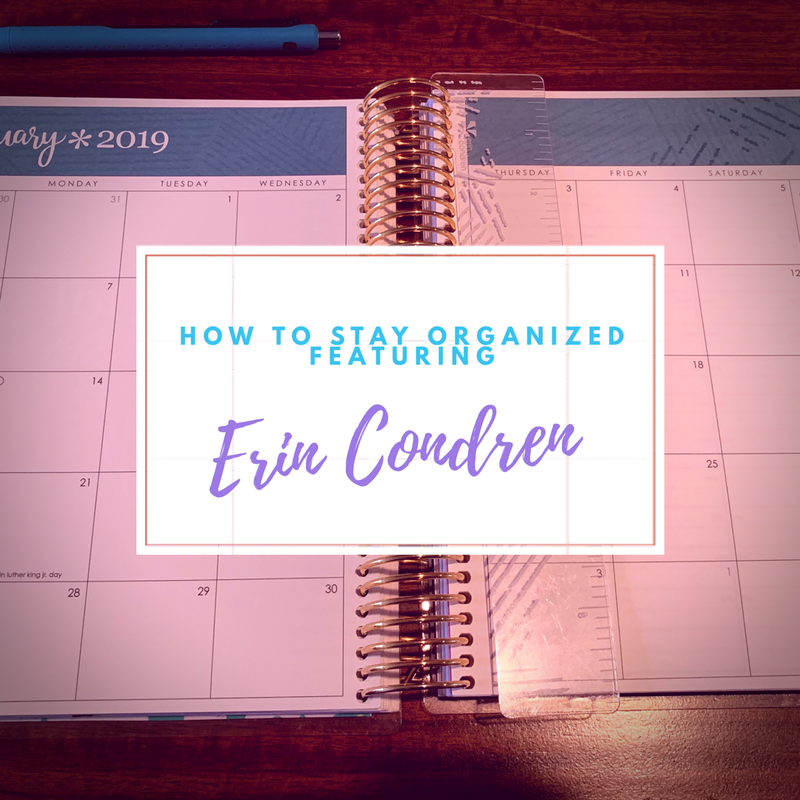 Start becoming organized today with an Erin Condren Life Planner! Let me know if these tips help you become a more organized person or if you have more tips!